During February 2016, we decided to make a day trip out to Pinnacles National Park from the SF Bay Area. The drive from the SF Bay Area takes about 3 hours each direction with the typical minor traffic around the Gilroy Outlets. Our hike at Pinnacle National Park was a simple one, Bear Gulch Cave from the East entrance. There is minor elevation change, but most of it occurred through high rising pinnacles. About halfway up the hike, you come across caves formed by toppling boulders. More amazing, the hiking path goes right through the caves! There are stairs where necessary, but other than short sections of pure pitch darkness, solved by our cell phone flash, the only thing to be careful of is the wet rocks. The hike itself only took a couple of hours, and there were plenty of kids on the trail. 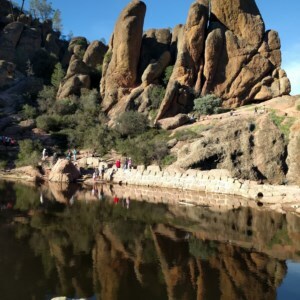 At the top of the trail is a large lake with amazing views of the iconic pinnacles. From there, you can continue on the trail for more adventure. Based on my experience, visiting on a holiday is not a good idea unless you get there early. The parking lots are limited and once they're full, you'll have to wait for a car to leave before another can park. Since Pinnacle only recently became a National Park, the infrastructure is not quite there to handle huge crowds. Pinnacles National Park, previously known as Pinnacles National Monument, was declared a National Park in 2012. It's about a 3 hour drive from San Jose, with a very convenient rest stop for food and shopping, at the Gilroy Premium Outlet. Much lesser known compared to larger parks like Big Sur and Yosemite, it is just as beautiful. From my research, I learned that summertime at Pinnacles National Park can be overwhelming hot. There are two entrances (east and west) that are only connected by hiking trails.